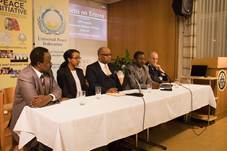 On November 3rd 2017 UPF Austria in cooperation with the Permanent Mission of Eritrea at the United Nations in Vienna, UNCAV – United Nation Correspondents Association and the „Horn of Africa“ Peace Initiative organized a panel discussion with the topic „Beyond Refugee Crisis and Human Trafficking - Perspectives for the Youth in the Horn of Africa with a special Focus on Eritrea“. The aim of the panel discussion was to reflect the untold story and share the view and experience of the horn on human rights in relation to the recent phenomenon of migration. 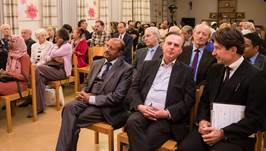 The event was attended by some 100 guests: diplomats, UN staff, investors, members of civil society, interested Austrian nationals, friends of the horn and in particular Eritrea. 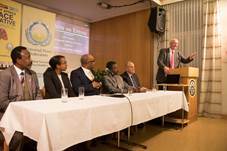 It was also attended by people from Africa; mainly states of the horn: Eritrea, Ethiopia, Kenya, Somalia, Sudan and South Sudan. 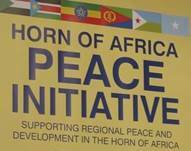 The session focused on „Engaging with & Understanding the Horn of Africa – Focus on Eritrea“. The discussion was opened by the president of the hosting organization Mr. Peter Haider. He welcomed the guests and gave a brief introduction on the general objectives of the event. In his the opening remarks Mr. Haider said that his organization has hosted a number of events but the present one is unique in its content and focus. 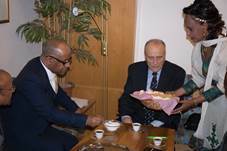 He then thanked Mr. Abdelkadir Hamdan, Counsellor of the Eritrean Embassy in Germany and Representave to the Permanent Mission of Eritrea to the UN in Vienna, for his efforts to make this event happen. 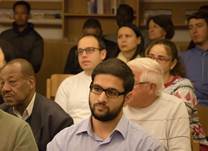 After the opening remarks, the audience were given the opportunity to see a short video on the achievements of the Government of Eritrea in laying down the basic fundamental infrastructure. 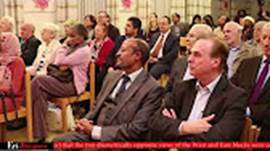 The moderator of the event, Mr. Yared Tesfay, communication officer of the Embassy of Eritrea to the UK and Northern Ireland in London thanked all the guests for their interest in the Horn of Africa and expressed his hope that the forum will bring some light to the issue of migration and youth. He also expressed his confidence that the event will contribute to creating an alternative perspective in addressing the issue of the European refugee crises and migration. The Key note speaker of the event Mr. Adem Osman, charge d’affaire of the Embassy and Permanent Mission of Eritrea to the UN and other international organizations in Geneva, based his presentation on the general application of human rights law, the mechanisms put in place to promote and protect human rights with particular focus on the conduct of business of the UNHRC and the mandates of the special procedure. He stated in his presentation that there is strong need to look at the history of the horn in order to have a sober analysis of the present and the future opportunities and challenges. On that note he emphasized that the coastal states of the horn have become victim of their own location as it gives them full control over one of the world’s main maritime trade roots. Among other arguments, Mr. Adem substantiated his argument by the fact that the two diametrically opposite views of the West and East blocks were compelled to be served by one agent (Mengistu Haile Mariam) proves nothing but the magnitude of the interests that the superpowers have. According to him, the strong interests of the superpowers that benefited from a regime derived by a blind desire to get access to the Red Sea in return of any demand have negated the people of Eritrea the right to self-determination that was restored in 1993 by a popular UN backed referendum. Pursuant to the presentation, the price tag of negation of the self-determination was the loss of 65,000 martyrs and 10,000 persons with permanent disability and unimaginable lost opportunities. He underscored that Eritrea is the product of such a struggle and will continue to put the necessary infrastructure in its social justice driven developmental programs. However, according to him, the full enjoyment of human rights needs robust economic development and stability. Whenever these are threatened, states tend to introduce varying degree of security measures. The real measurement is therefore, whether a state is heading to the right direction or not. 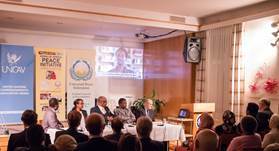 On the issue of trafficking and smuggling the key note speaker said that there exists no human trafficking inside Eritrea as there is strong and effective government. However, he said smuggled people may end up being trafficked in the course of their dangerous journey in countries of transit. 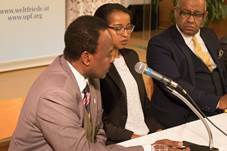 Speaking on the migration issue, he said that Eritreans were driven by strong pull factor facilitated by a networks operating from mostly the camps in Ethiopia and some of them are operating in countries of the destination. 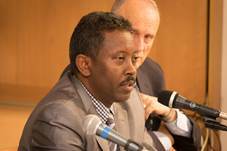 He further said that the number of Eritreans fleeing the country is at its lowest now. 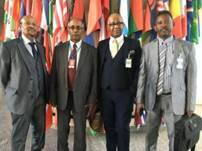 He also called upon the world community to shoulder its responsibility to pressure on Ethiopia to evacuate the territories of Eritrea in accordance to the binding ruling that could ultimately be helpful in the relationship of the countries towards a better harmonized horn. He also highlighted the economic growth and the possibilities for investors. 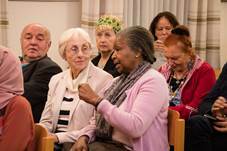 He then responded to a range of questions posed by participants form the audiance. 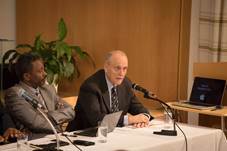 Dr. Walter Lichem, who is a former Austrian Ambassador to Chile and Canada and who also served as head of the department of international organizations, spoke on his decades long interests on Eritrea touching on many issues of geopolitics. 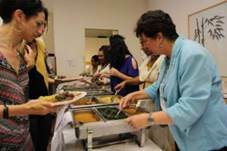 He focused on the cohesiveness of the Eritrean society and the resources. He advised Eritrea to benefit from its cohesiveness and proposed to established human rights cities to combat accusations. 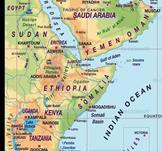 He shared his view that Eritrea is in the right path that needs time and space. He also spoke on the failure of the international community to enforce the binding ruling of the EEBC. 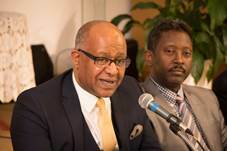 DI Abdallah Sharief, President of United Nations Correspondents Association (UNCAV) and co-founder of the „Horn of Africa Peace Initiative“, who is from Sudan shared his personal experience on migration when he came from his native country to Europe, first to Hungary then to Germany and Austria in the early 70s. He also gave some facts and figures on migration and youth. A young University student, Ms. Fartun Osman from Somalia, shared her personal experience and told the audience that the situation in her country is improving a lot and seems promising. Finally, participants who were given a time to pose their questions. They said that the forum has enlightened them on the situation and challenges that the horn continues to face and requested that such events be repeated in the future. In his closing remarks Mr. Peter Haider stressed the importance of the forum in bringing together the stakeholders from all fields to address and share their experience, as well as reflect the reality in Eritrea and the Horn of Africa and explore further opportunities. 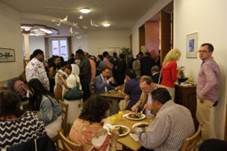 The event was followed by a dinner, prepared by the Eritrean community in Vienna, which also created an opportunity for further informal discussions.